Nicolas Cage is one of those actors who somehow seems to be endlessly entertaining, no matter what it is he's doing. Nic Cage Took A Trip To Kazakhstan And It Produced An A+ Picture – Today he’s sent the internet into absolute hysterics and all he’s doing is posing for a picture. To be fair though, oh, what a picture it is. 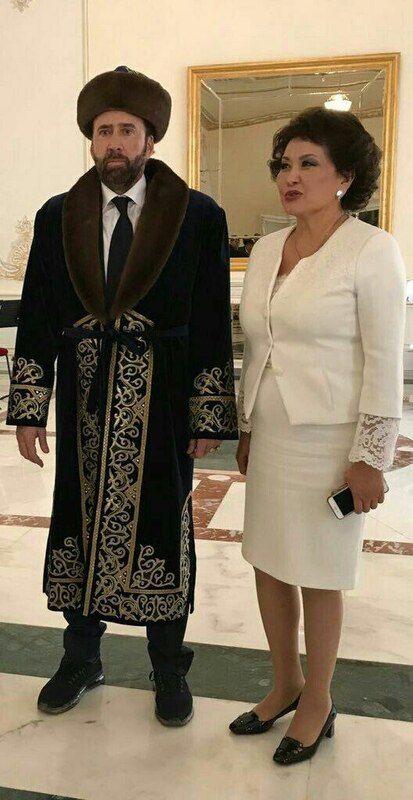 Nicolas Cage was in Kazakstan for a film festival over the weekend, you know, like you do, and posed for a picture with the first lady of the country. His wearing of the traditional robe and hat would be worthy of notice enough, but it’s the look on his face which transforms this picture to a piece of true art. Check it out. It’s the same look that you get on your face when you show up to a costume party only when you get there you discover it’s not really a costume party and you’re the only one in costume, but you live too far away to go back and change so you just walk in and try to act like this what you wear to parties all the time. The average temperature in Kazakstan in July is 75 degrees Fahrenheit. Not for nothing, but I’m going to guess that even when that outfit was the standard dress in the area, they probably didn’t wear it much in July. Just an observation. There was a time when Nicolas Cage was known as a major Hollywood celebrity. He made popular blockbuster movies and award caliber dramas as well. These days he’s mostly just known for being Nic Cage, so we have to say that this picture is far from surprising.